Hello, everyone! I was thrilled to be asked to be your tour guide for the day as part of the HappyCow Road Trip Blog Tour! 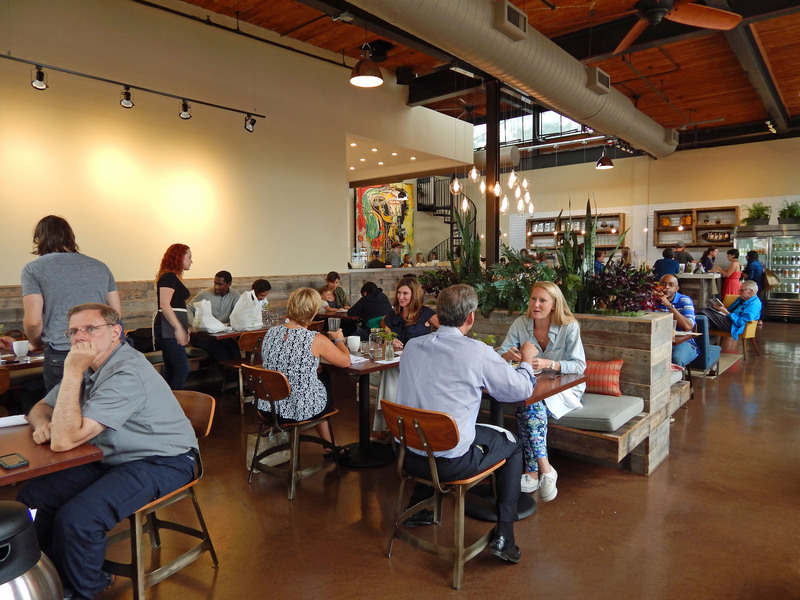 Today I want to welcome everyone to Charlotte, North Carolina and take you on a visit to one of my favorite vegan restaurants – Luna’s Living Kitchen! Afterwards, I’ll briefly review the HappyCow Cookbook and then we’ll make one of Luna’s trademark recipes! 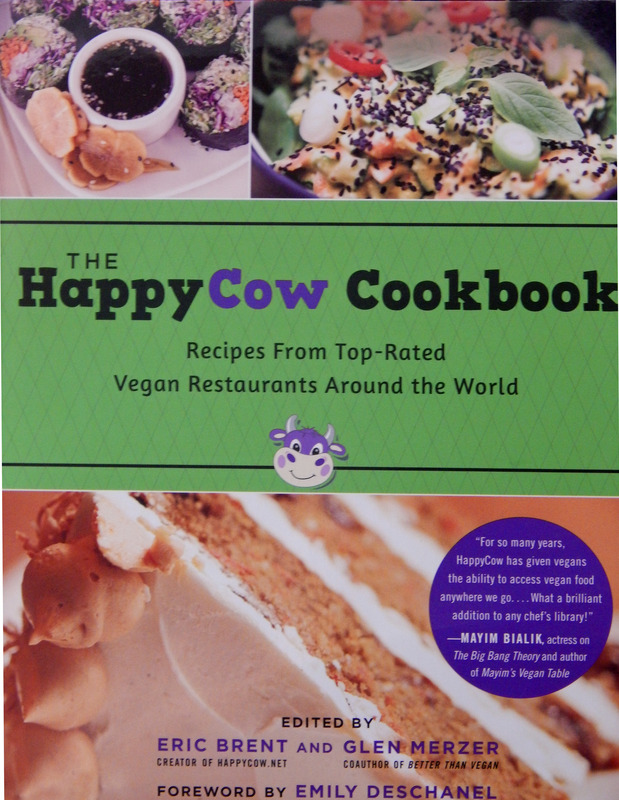 Finally, you’ll get a chance to win your very own copy of the HappyCow Cookbook! 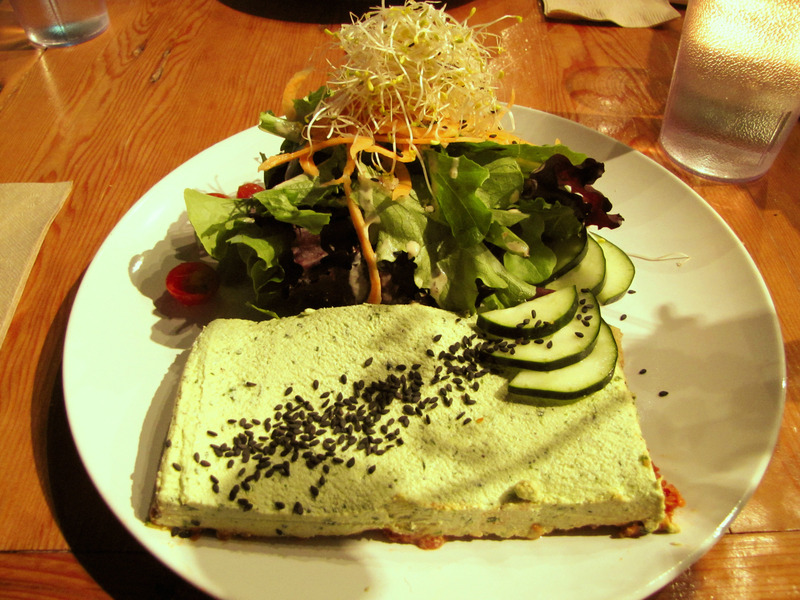 And, yes, I did say ONE of my favorite vegan restaurants. Because Charlotte – land of Bankers, Beer, and BBQ – actually has several all-vegan restaurants! Bean Vegan Cuisine (vegan comfort food), Zizi’s Awesome Vegan To Go (vegan deli), Nourish (a vegan meal delivery service), and Masa Casa (a vegan food truck). 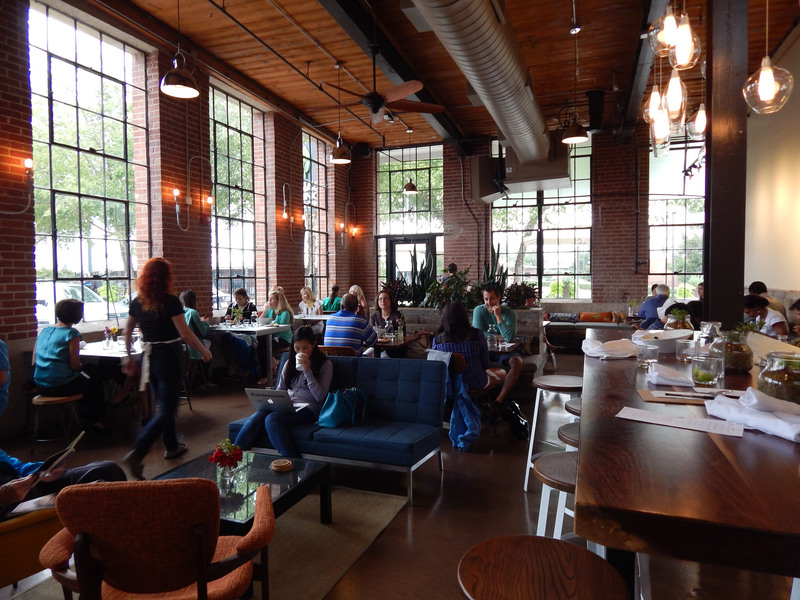 After the HappyCow Cookbook went to press, Luna’s Living Kitchen moved into a much larger space (still in the historic Atherton Mills). Tables are consistently full during peak hours. Expect a wait, but it’s worth it. There are the yogis, the hipsters, and the college kids you’d expect to see in a vegan restaurant. But you will also see senior citizens, men and women in business suits, and athletic young men who look like they could play for the Carolina Panthers. Lunchtime at Luna’s. Every table is full! Luna’s Juice and Smoothie Bar is in the background. Luna’s Juice Cleanses are also very popular. If you’re visiting Luna’s for breakfast, you can’t go wrong with Swiss Bircher Muesli or one of their smoothies. For lunch or dinner, here’s what I would suggest for a perfect meal. Tri-Color Hummus. I usually don’t order hummus when I eat out, because it’s so easy and inexpensive to make my own. But this is hummus with a twist – made from sunflower seeds and in non-traditional flavors (lemon-parsley, sweet curry, and roasted chipotle). Additionally, the cranberry-walnut bread is delicious! 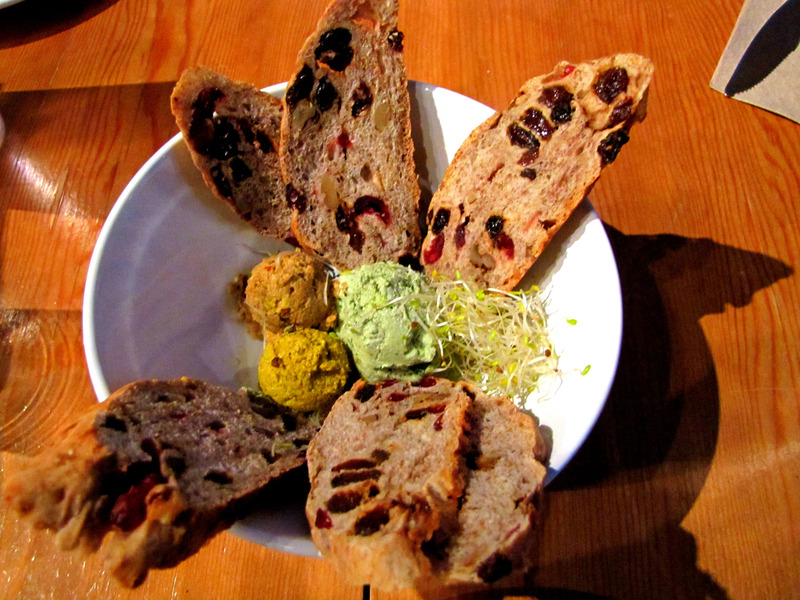 The servings look small but the sunflower seed hummus is more filling than chickpea hummus. It’s the right amount for two people. The Lunasagna. Zucchini noodles, sundried tomatoes, mushrooms, and oooh that cashew basil cheese! This is an absolutely delicious cookbook that takes you on a tour of vegan restaurants all across the world. There’s an interview with the owner of each all-vegan restaurant, followed by recipes for several of that restaurant’s signature dishes. Almost every recipe has a gorgeous, full page, full color photo (which is extremely helpful in visualizing some of these creative dishes). You should know, however, that these are recipes for special occasions or when you have a little time to experiment in the kitchen; these are NOT recipes to try when you’re frazzled from work and trying to put supper on the table in 20 minutes. Muesli is a staple breakfast in the Swiss Alps, packed with heart healthy oats, fruit, and protein. This quick and easy recipe can be whipped up the night before and served in minutes for breakfast. 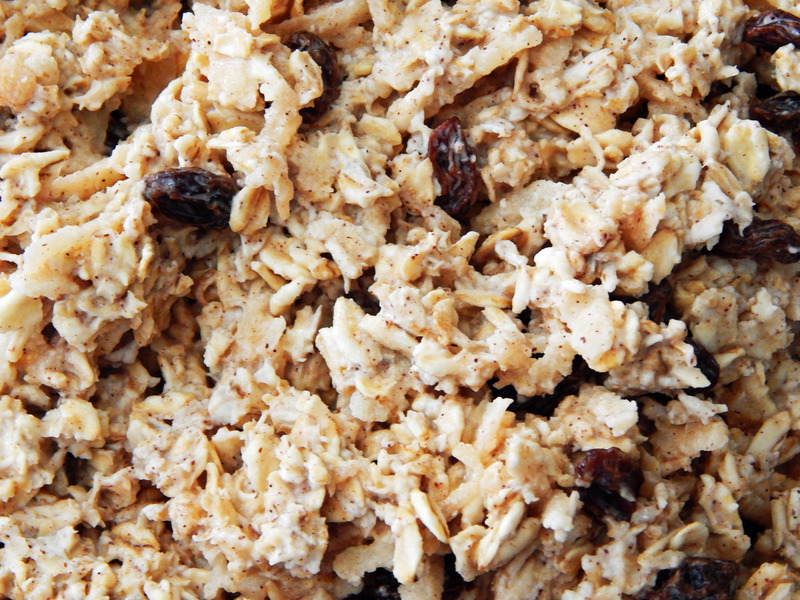 Combine the oats, grated apple, raisins, orange zest, cinnamon, and salt in a container with a lid. Juice the oranges and combine juice with the milk and agave syrup in a separate bowl. Add wet ingredients to the dry container and incorporate thoroughly. Seal the container and refrigerate overnight. Serve the following day with fresh banana slices. I halved the recipe. 9 cups of oats seemed a lot. Even a half recipe makes a good amount (I’d say enough for four people). The recipe didn’t specify whether to use quick oats, old fashioned rolled oats, or steel cut oats, so I chose old fashioned rolled oats. This is one of those great recipes you can alter to suit your own taste. Maybe try dried cranberries in the winter instead of raisins. If you live in the United States or Canada, you can enter to win a free, brand new copy of the HappyCow Cookbook shipped to you direct from the publisher! You’ll need to click the link to go to Rafflecopter. Contest runs from now until 12:00 AM August 14, 2014. I couldn’t resist bragging a little about our other vegan peeps! But Luna’s deserves the honor – I believe they opened in 2010 which made them the first vegan restaurant. They paved the way for the others! 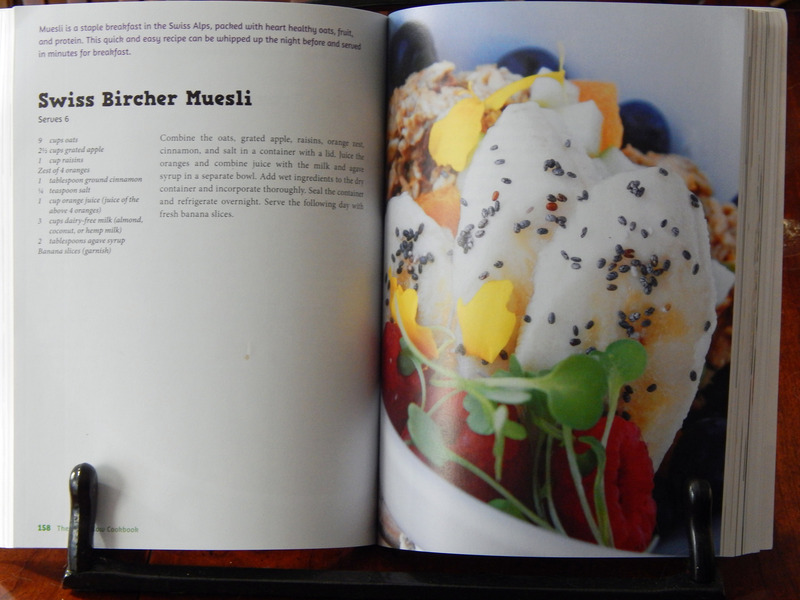 The cookbook also includes Gaia’s Treasure (a raw veggie stir-fry) and Chia Pudding. All of the Luna recipes are easy! Beautiful place. One of your pictures has a picture of a good looking man wearing a Carolina Panther Jacket. It looks like this may be your Dad. This may explain where you got your good look and smarts from. I’ve been following Happy Cow for years- so nice to see there is a Vegan population in Charlotte- we’ve been thinking about a move to the Carolinas- we are just trying to figure out where! When I was in Charlotte about 15-20 years ago, there was no vegan food to be found. Glad to hear that things have changed for the better. Yep … I first went pescatarian and then veg about 15 years ago and that was ROUGH! 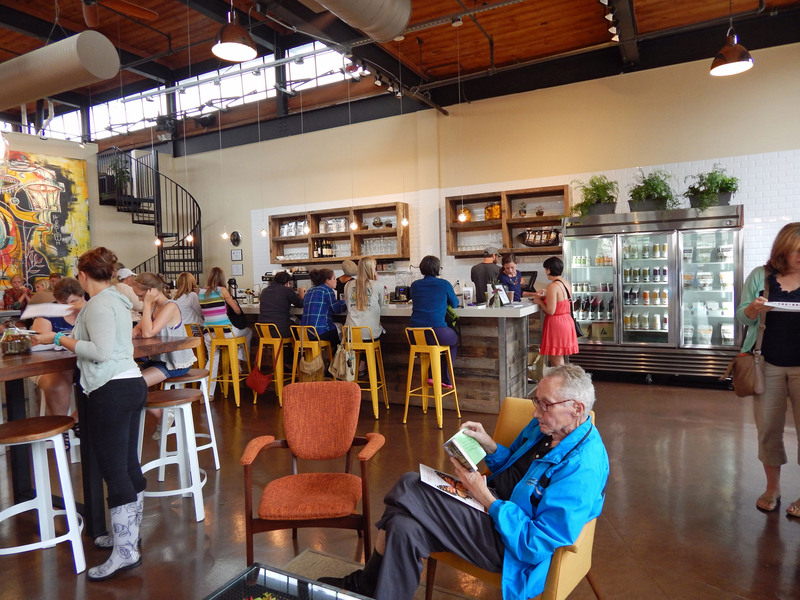 Charlotte has changed … not only the restaurants but the supermarkets, farmers markets, and small vendors. It’s easy to be vegan here now! A cookbook addict does not need to read about another cookbook. Sounds like a good book and based on my one time of eating there, I sure would be interested in some of their recipes. It’s a great cookbook! You can read it almost like a novel! Everything looks delicious at Luna’s and I can’t wait to try the recipe you shared! It sounds like a very tasty and satisfying way to start the day.